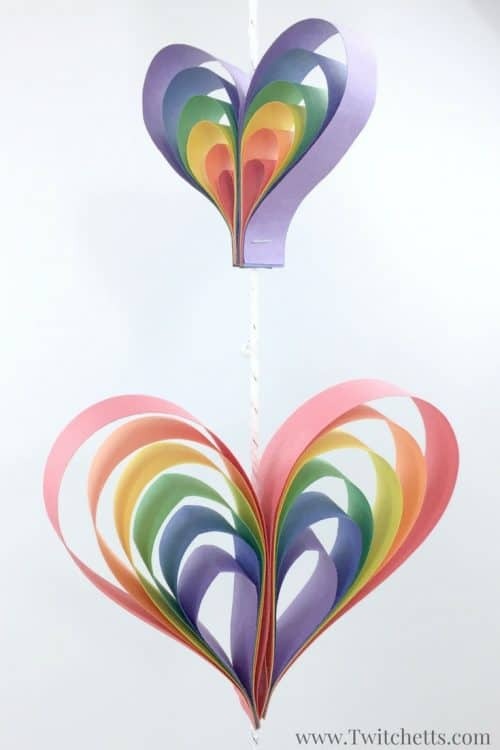 Create this beautiful spinning rainbow heart mobile using construction paper! 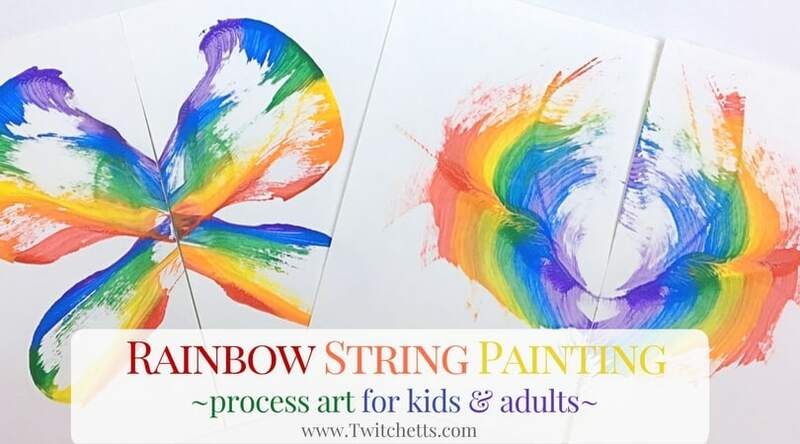 This is a fun kid rainbow art project that makes a perfect rainbow craft for preschoolers, kindergarteners, and kids of all ages! Do your little ones ever get stuck on something… a favorite shirt or show? Well, right now my youngest is loving all things rainbow! 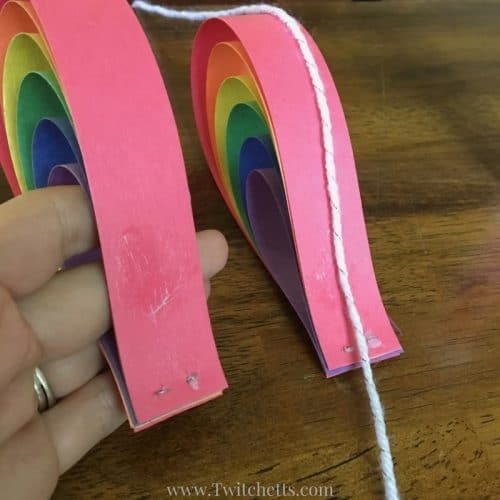 We have been creating a lot of rainbow crafts for kids lately to keep up with this new found favorite and this craft isn’t a bad one to have to hang around. 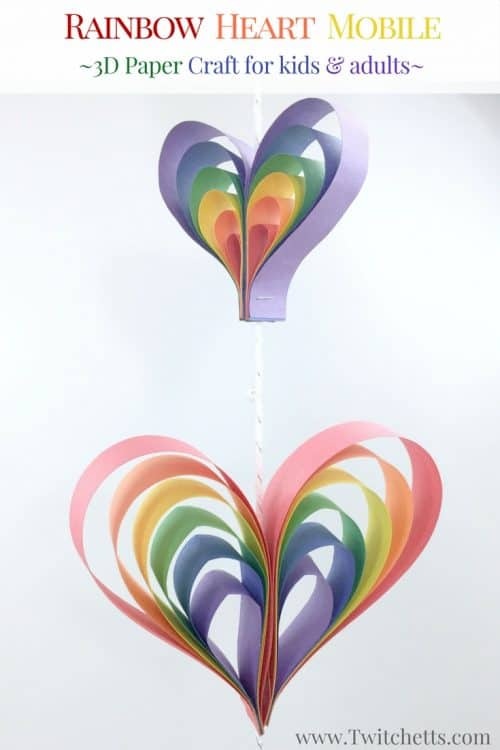 We made this heart mobile as a rainbow. 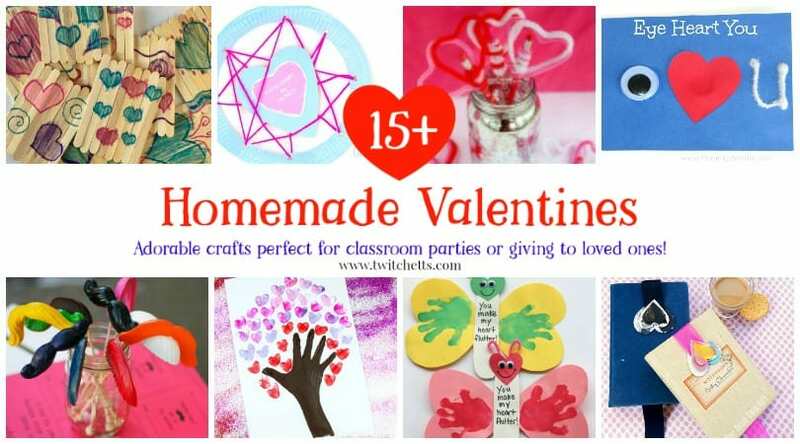 You could also use reds and pinks to make a fun Valentine’s Day craft! 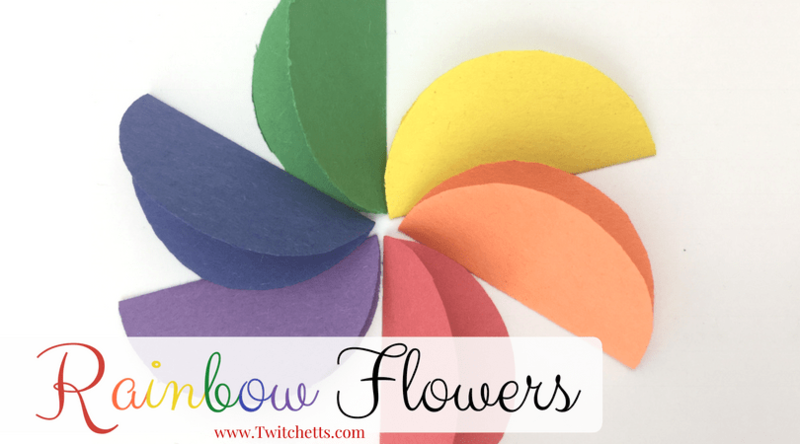 If you love simple paper crafts, you’ll love this rainbow flower! Construction Paper. Every color of the rainbow. Glue. White glue or a glue stick both would work. Clothes Pins or Paper Clips. 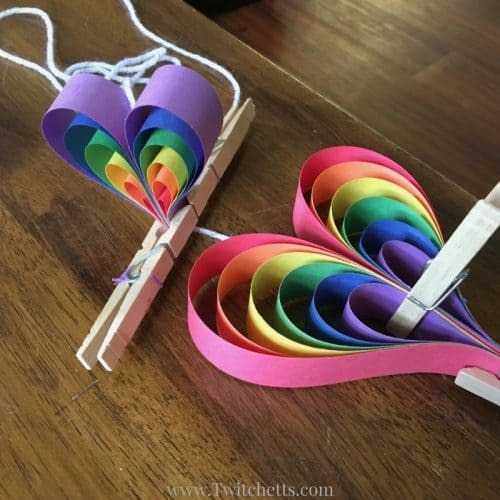 The process we use for this heart mobile has been used in the past. Check out our shamrocks, turkeys, and even something for mom. It’s a fun little craft that can be simple once you get the hang of it! 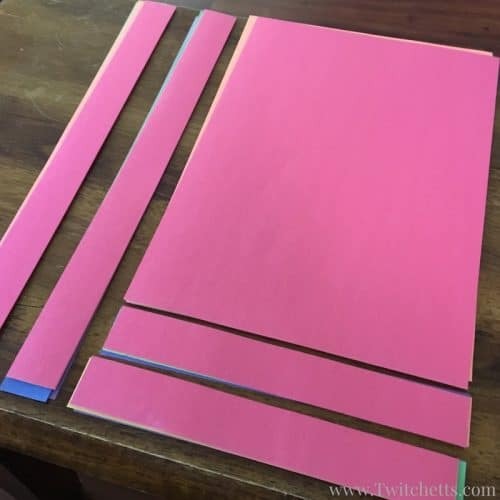 Start by cutting yourself paper strips. You need two strips of two different lengths for two different sized hearts. 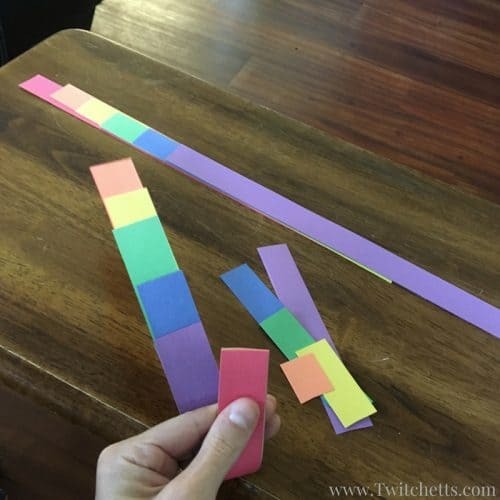 Next, lay them out so that you can see each color, in rainbow order. Whichever color is on the bottom will be the outer layer of the heart. Grab your strips and trim off the colors that hang over the bottom of your outer color. In this picture below the outside color is red. 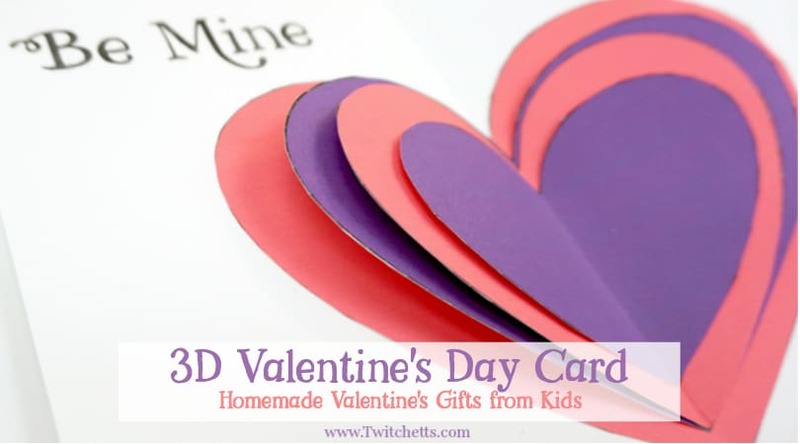 19 paper heart crafts your kids will LOVE to make! You should be trimming off a little orange, more yellow, and so on until a large amount of purple. Starting with your smallest strip, purple in my example, create a teardrop. Next, fold over the blue, green, and each color until you get to your red. Secure your rainbow teardrop with the stapler and repeat. You can make as many hearts in as many sizes as you want! Lay your hearts with the prong side of the staples facing up. Add glue to both pieces and lay your string right down the center. Secure with clothespins or paper clips until dry. You can place multiple hearts on the same string. Once they are dry remove clothespins and hang your heart mobile! 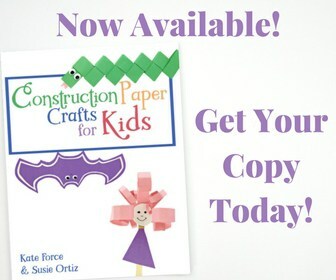 See the whole construction paper craft in under 2 mins in our video! Pin This to your Paper Craft Board!